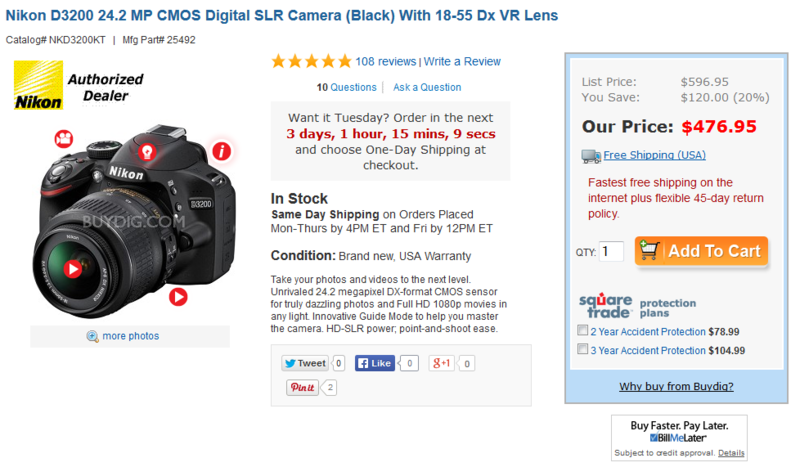 Sears has two great deals on camera back today. 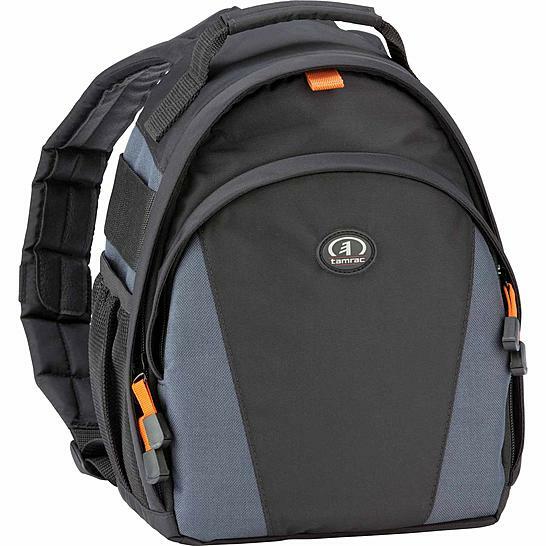 The Tamrac Jazz 81 SLR backpack is $44.95 with free shipping. 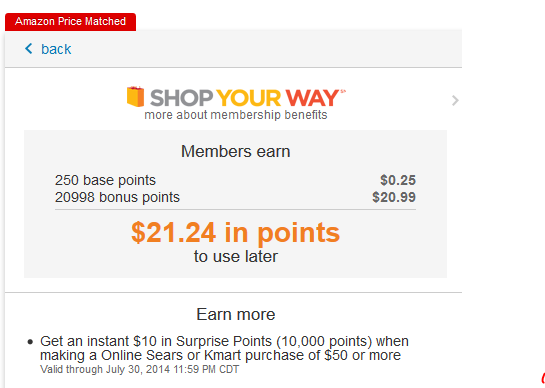 The deal is that you will earn $32.24 in Sears / Kmart points for later use. This is a great bag for the price. 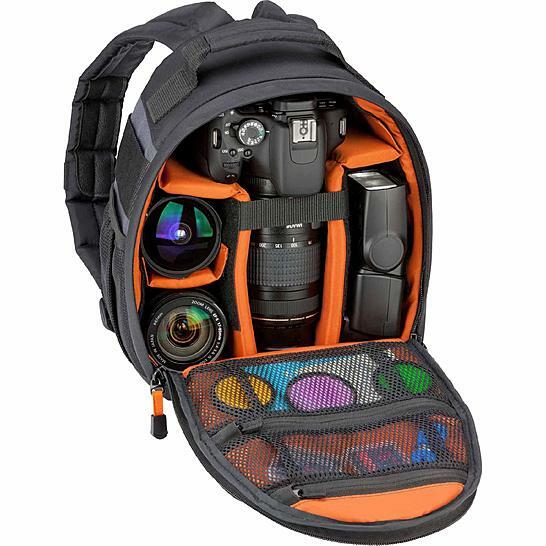 In the picture it’s being used to hold 3 lenses, a DSLR body and a large flash. The color choices probably aren’t what I would use if I was designing it from scratch, but they certainly aren’t bad. This definitely isn’t a hot pink camera bag that Sears is just trying to dump on the masses. The Sears price works out to be $44.95-$32.24= $12.71 + tax for most people. How does this price compare? 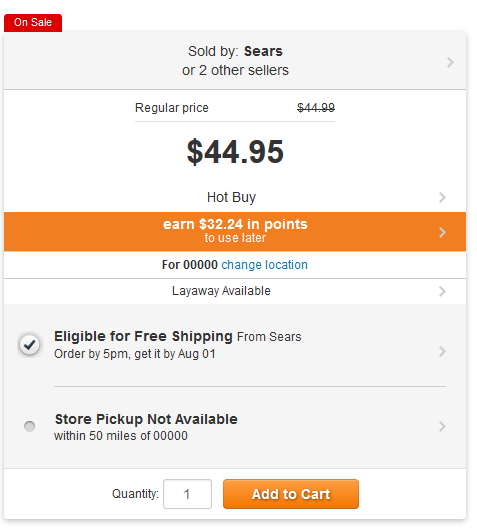 All but one other store I’ve found charges the same price as sears ($45) before the points are factored in. The only store I’ve found selling it for less is a new reseller on Amazon asking $30.49 after shipping. Overall, this appears to be a hell of a price if you will use the Shop Your Way Points. How Does This Price Compare To Similar Products? I personally use the AmazonBasics SLR backpack. It is great quality and costs $29.99 shipped. Case Logic SLR backpacks cost even more at $49.99 and $69.99 respectively. Even compared to the low priced AmazonBasics deal, this offer from Sears for $13 after Shop Your Points is dirt cheap. The second camera bag deal from Sears is even cheaper. 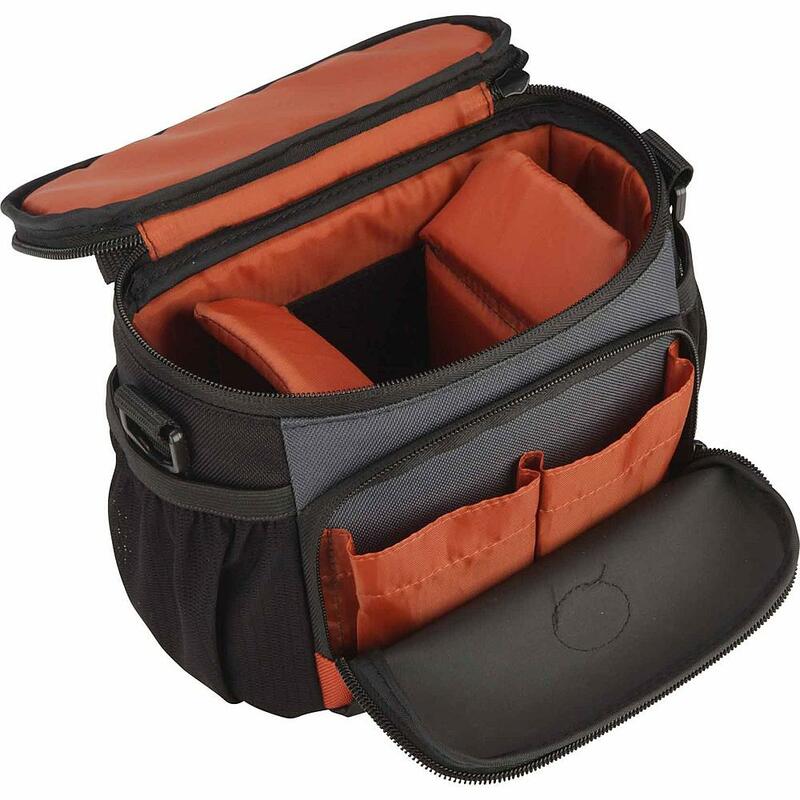 You can buy the Tamrac Jazz 36 compact SLR camera bag for $25 and earn $21.24 in Shop Your Way Points for later use at Sears or Kmart. Sears is marking this deal as an Amazon price match. I’ve frequently seen Newegg and Amazon match each others’ price, but this is the first time I’ve seen Sears get into that game. Sears is fighting hard to offer the lowest costs on an assortment of items. Here is what the second bag looks like. Most merchants also charge $25 for this bag, so for just $4 after factoring in the Shop Your Way Points, this is a heck of a bargain. 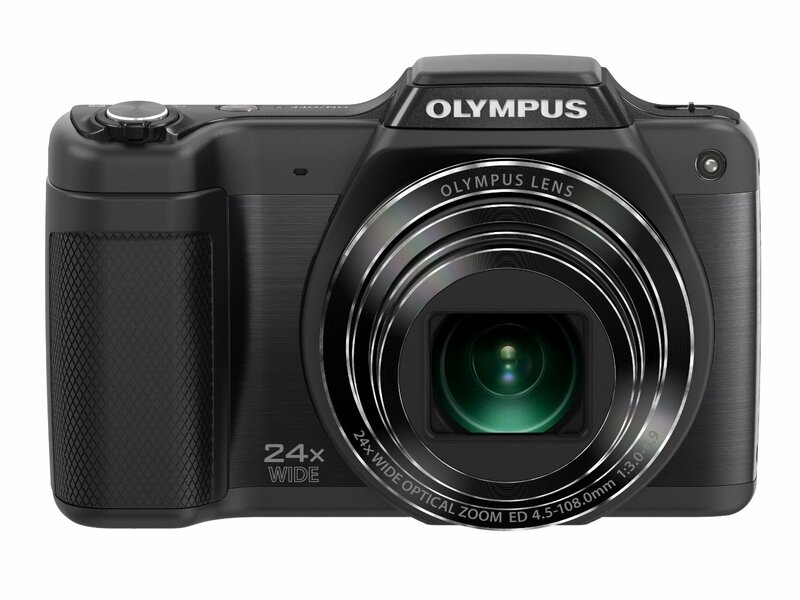 Ebay has a deal on an Olympus Stylus SZ-15 camera for $69.99 shipped. The seller is listed as db_roth with 96,159 ratings and a 98.8% positive rate. Despite the fact that I just ordered a Canon ELPH that has yet to arrived, I’m interested in this deal. Olympus has a solid reputation. The price for their camera equipment has plummeted since their financial scandal in 2011. This situation has been horrible for Olympus but great for bargain hunters, looking to purchase best in class camera technology at rock bottom prices. I’m also interested in this deal because I’ve always been fond of a more substantial camera. I like the the feeling of having a point and shoot smaller than a DSLR but large enough that it fills my hand and can’t fall out of my pocket without me feeling it. This camera also has a 24x optical zoom. I’m sure pictures look awful at the max focal length. It’s still a neat feature to have in a camera that costs a mere 70 dollars. The Olympus SZ-15 costs $40 more on Amazon. The best price in Google Shopping is $100 shipped from B&H Photo. It looks like the Ebay deal is hella good if you are in the market for an affordable point and shoot superzoom. How Do The Reviews Look? Unfortunately, the reviews are a little too mixed for me to bite when it is all said and done. I would be more inclined to gamble on it if I hadn’t just bought the Canon. That said, there are some glowing reviews for the SZ-15. Photographyblog gives the model a recommended 4 out of 5 stars. The overall rating on Amazon is 4 stars with 52 reviews. 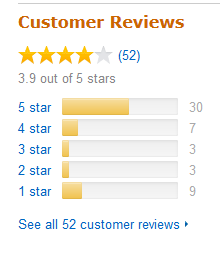 I’m a little more concerned with the distribution of the reviews than the overall number. 30 reviewers give the camera 5 stars, but 9 people give it 1 star. The ratio of 1 star reviews is higher than I would like. The reviews get downright abysmal on Google. The SZ-15 has a pitiful 2.5 star rating with a combined total of 126 reviews. This is the final number that scared me away from giving this camera a try. Buydig has a Nikon D3300 DSLR with 18-55mm lens and Adobe Photoshop Elements and Premiere Elements 12 for $496.95 shipped after coupon code BCD500PX. The coupon takes an extra $50 off the original price of $546.95. How Much Are You Saving? The new version of the Nikon D3300 kit costs $100 more on Amazon. Cameta Camera has the next best price on the refurbished Nikon D3300 kit. They charge $514 shipped. They also sell the body alone for $429 shipped. The Buydig deal is still $17 better for kit. I wouldn’t say this is the type of deal that you have to act on immediately or you will never find a price as low again. Of course, the Cameta deal doesn’t come with the Adobe software, so if that interest you, the Buydig deal looks substantially better. If you haven’t heard of Cameta Camera before, they are one of my favorite places to buy camera equipment. They are consistently one of the cheapest places on the Web to buy camera equipment. They also have a 97% favorable rating on Amazon with over 205,000 reviews. This is a pretty good indicator they are legit. How Good Is The Nikon D3300? The Nikon D3300 is an entry level DSLR. That said, people love this camera. It has a 5 star rating on Amazon with 56 reviews. The four people who have reviewed it on Buydig also gave it 5 stars. Shoppers on Google seem to be a tad pickier and have given the D3300 a 4.5 star rating with slightly more than 30 reviews. When I looked more closely at the negative reviews on Google, all three were from Best Buy customers. These customers appeared to be idiots. One complained of bad pictures without saying much else. Another user complained that the range of the camera sucked with the provided lens. My solution to them is to buy another lens. The kit lens is only supposed to provide the most basic starter equipment. Overall, I would say the Nikon D3300 kit deal from Buydig is lukewarm. If you are just interested in the camera, you can find similar prices a variety of places. If the Adobe software is attractive to you, this deal is pretty good. The Canon direct store is offering some great deals on several refurbished products. Refurbished Canon products are usually new or just like new, so there is nothing to worry about when making these purchases. I have personally bought five Canon refurbished products and never had any trouble. The cost savings are usually significant. 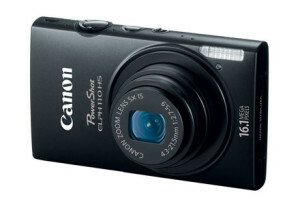 The first offer I want to highlight is a Canon PowerShot ELPH 110 HS for $59.99 with free shipping. I personally bought one of these cameras for myself and one for my dad. I’d always wanted an ELPH for their combination of tiny size and great picture quality. 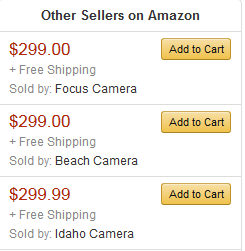 A few years ago these cameras were consistently in the 300+ price range. God bless the ever falling price of technology. Compared to other cameras in this price range, you can’t go wrong. Here is how my receipt looked for the 110 HS. 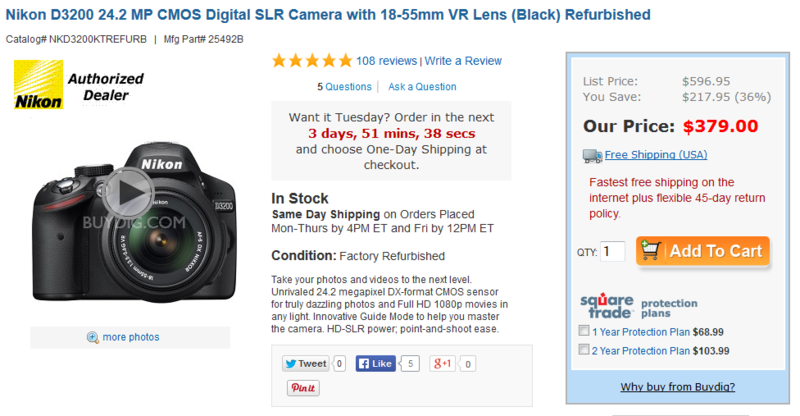 The second deal is for a refurbished 50mm DSLR lens f/1.8 for $70 shipped. This is my favorite lens for taking indoor shots. The image quality is significantly better than lenses I have that costs several times as much. This should be the first lens anyone buys when they take the leap to digital SLR cameras. Like all refurbished Canon products, this lens comes with a full 1 year warranty. Finally, you can buy a refurbished T3i 18 megapixel starter kit with an 18-55mm lens for just $336 with free shipping. This is the body that I currently use most of the time I’m just walking around taking pictures. It’s a hell of a bargain that is certain to not disappoint anyone on a budget. This body will launch you into the Canon ecosystem. This is an important first step since Canon and Nikon make the best consumer grade DSLR cameras out there. Other companies make perfectly good cameras, but I wouldn’t want to be out buying Sony or Samsung lenses. I just don’t have as much faith in the brand as I do with Canon and Nikon. Amazon has a killer deal on a Samsung NX2000 20.3MP CMOS Smart WiFi 4/3rds camera. 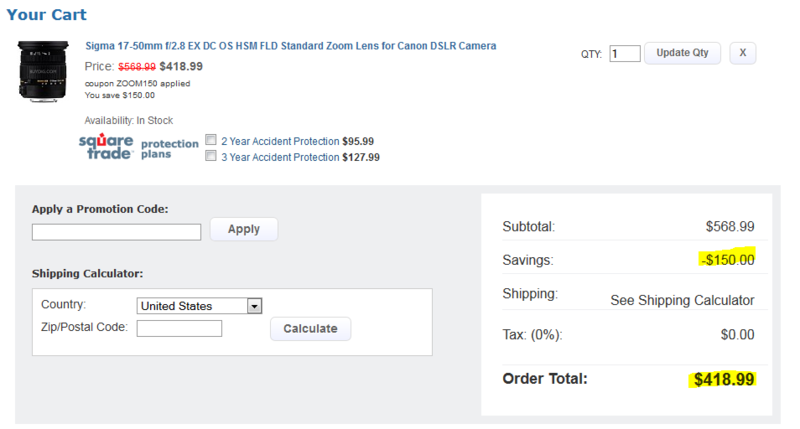 They are selling the body with a 20-50mm lens for $199.99 shipped. The list price on this model is $649.99 and almost everyone else is selling it for $100 more. Even the refurbished versions of this camera with lens are selling for $279.99 on Amazon. New versions are going for $299. The cheapest alternative listed in Google Shopping is $260. The Amazon deal beats this by $60. 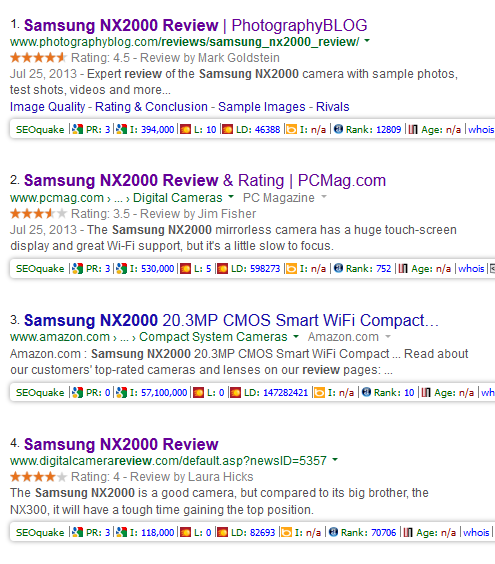 The Samsung NX2000 has stellar reviews anywhere you look on the Web. It has a 4.5 star rating on Amazon with 46 customer reviews. There is a similar 4.5 star rating on Google Shopping with 28 reviews. Photographyblog gives this camera 4.5 star rating. PCMag gives it 3.5 stars. 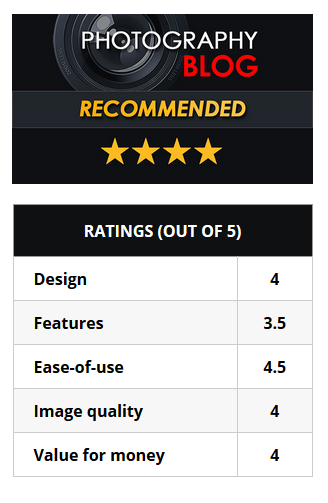 DigitalCamerReview.com gives is a 4 star rating. No comparable 4/3rds cameras are currently at this $200 price point. However, there are many good choices if you are willing to spend more. The Olympus E-PM2 is a stellar choice. Those willing to buy the gray version can buy it for slightly over $300. The Panasonic Lumix GX7 is an amazing camera, but you are looking t ospend closer to one thousand dollars for it. Fuji has some great options, particularly in the form of the X-T1, but it costs a small fortune at $1300 for just the body alone. The Amazon deal on the Samsung NX2000 for $200 shipped with a 20mm-50mm lens is the best I’ve seen. The only comparably priced cameras I’ve seen in this category are the Nikon 1 J1 cameras. Those cameras were relatively obsolete though with just 10.1MP. The Samsung deal is for a camera that has been on the market for barely a year. The only aspect that would concern me is being stuck with the Samsung architecture. While they make great electronics in many areas, the brand isn’t as proven as Nikon, Canon or even Olympus and Fuji. The real costs from cameras with interchangeable lenses usually arise from buying new lenses and not the initial investment in the body with stock lens. Still, it would be hard to go wrong at this very attractive price point. 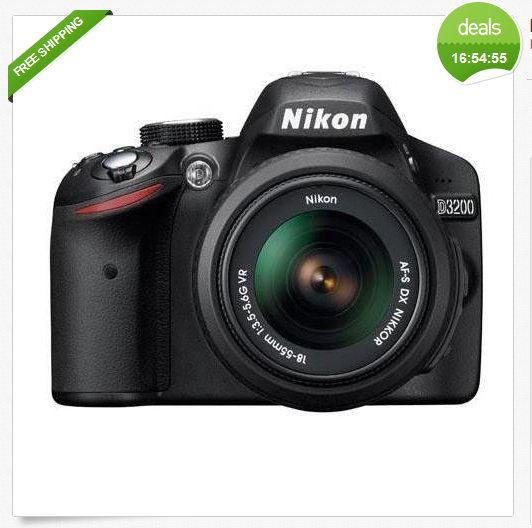 Buydig via Ebay has a great deal today on an entry level Nikon D3200 DSLR kit. This deal is scheduled to expire on July 2, 2014. For $320 shipped you will receive the D3200 body and an 18-55mm lens with image stabilization. $320 is a highly affordable price point for many. Photography isn’t a cheap hobby. Taking the step from point and shoot cameras to using a DSLR is a night and day different for many shots. Investing in a DSLR now can allow you to build a hobby for life. When you buy a DSLR, you are committing yourself to that company’s equipment. Personally, I’d only invest in either Nikon or Canon DSLR cameras. Sure, you can find great offerings from Sony and Pentax. I still couldn’t in good faith recommend going in this latter direction. The options and future prospects for Canon and Nikon are so superior, it isn’t worth it to commit to a different company’s architecture. Ebay deals can make me nervous. I was burned a couple times in the past buying from some no name sellers with little to no feedback. Fortunately, this deal is actually being sold by BuyDig. They are one of the most respected names in eCommerce based camera sales. They advertise themselves as the Internet’s digital superstore. I don’t hold this uninspired catch phrase against them since they have a great selection with good prices. They are currently ranked as the 13,811 most popular site on the Web by Alexa. They also have 311,000 pages indexed by Google. This latter number is a good representation of how many products they offer. BuyDig itself sells the new version of the D3200 kit for $476.95. By buying the refurbed version through the Ebay offer, you are saving over $150. I personally have no problem buying refurbished camera equipment at this level. In my experience, it has offered a tremendous value proposition, but I can say that because I’ve never been burned by it. 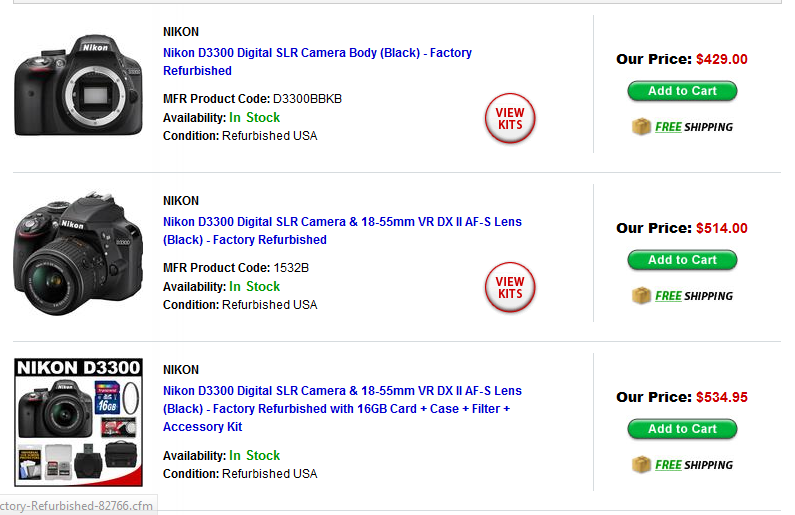 Even the same refurbished version of the Nikon D3200 costs almost $60 more from Buydig directly. Amazon charges $476.95 for the new version of the D3200 with the 18 to 55 mm lens. Their best price for the refurbished version is $375, meaning the Buydig deal via Ebay is still $55 better. The refurbished Nikon D3200 kit with 18-55 mm image stabilized lens from Buydig via Ebay is a best of web price by at least $50. If you are in the market for an entry level DSLR kit that will launch you into the Nikon ecosystem at a low price point. The official Canon website is having a sale on refurbished products. Orders priced over $500 receive a discount of $125. You can also receive discounts at the $250 level ($50 off), $100 level ($10 off), and $50 level ($5 off). This sale is scheduled to last until June 28, 2014. Shipping is set at a flat rate of $5. Refurbished Canon products come with a 1 year warranty. The discount works as long as the pre-discount total for the refurbished items in your cart is over $500. In the sample screenshot below, I have an order of five 50mm lenses resulting in a price of $383.95 or $77 per lens. Refurbished products from Canon have a rock solid reputation. Everything I’ve ordered looks and behaves like a brand new product. 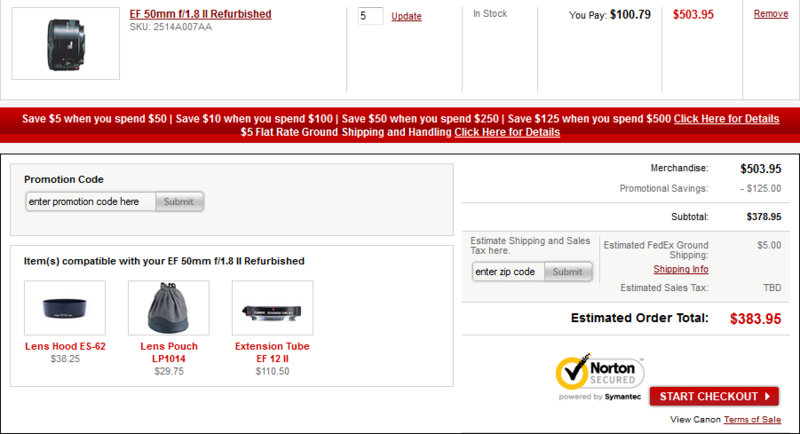 The Canon website is a bit annoying since it shows products even when they are out of stock. Obviously the discount is highest when you can get your order right around $500. You will still want to comparison show though. The 70-300mm lens on the Canon website is $399 after the $125. Abes of Maine is selling the brand new version of this same lens of five dollars less at $394.99 shipped. I apologize in advance if the above Ables of Maine link doesn’t direct you to the correct 70-300 mm page. Their content management system seems to be one of the odder ones I’ve encountered. 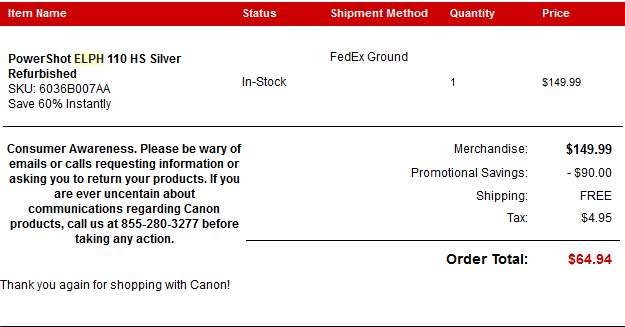 It is worth noting that you can earn an extra 3% cashback from the Canon site if you go through Mr. Rebates. A couple of the options I like is to buy the T3i kit with the 18-55mm lens and either throw in a 50 mm lens or 70 -300 mm lens. Alternatively, you could throw in the Speedlite 270EX II flash. What I like about doing this combination is you can get a great starter kit with either a solid lens or flash basically for free. Going with the 18-55 and the 70 – 300 to start would give you the most versatility in a highly affordable starter package since you could take both close up shows and telephoto images. Buydig is having a badass sale on several refurbished Nikkor lenses for Nikon cameras. I would be all over some of these deals if I wasn’t fully entrenched in the Canon ecosystem already. These deals require customers to enter the coupon code REFURB30 to take full advantage. 1. The Nikon 55-200 mm F 4-5.6 Nikkor Lens is $69 shipped after coupon. This is obviously a beginner lens, but this is still tremendous versatility at a dirt cheap price if you are early in the hobby or just don’t have much extra cash to throw around. 55-200mm means you can use this as a good walking around lens. 55mm is about the length where you would take many indoor shots. 200mm will allow you to zoom out on objects far away. List price on the 55-200 mm Nikkor is $270. The Amazon price for the refurb version of this lens is $134. The best price I saw anywhere was $90 and that was from a no name store that would be a total crap shoot. 2. Another good deal is on the Nikkor 18-140 mm f 3.5-5.6 lens with VR image stabilization. List price for this lens is $600 and Buydig is selling the refurb version for $279 shipped after coupon. Remember the code is REFURB30 to save an extra $30. The new version of this lens is $500 on Amazon. The refurbished version is in the $320 range, which is more than $40 more than the price we are currently looking at from Buydig. 3. 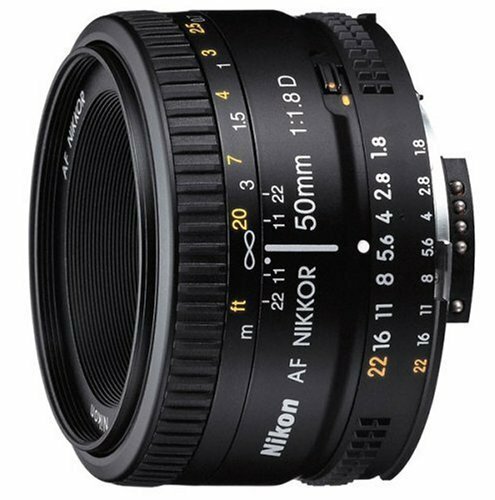 The Nikkor 24-85mm f 3.5-4.5 lens is priced at $299 shipped after coupon. It is worth noting that this lens has a 5 star rating on Amazon with 44 reviews. It’s impressive anytime you can get 44 people to agree on anything, yet alone the quality of a consumer product. This lens will cost you over $560 new on Amazon, but you only save about $10 through the Buydig offer when looking at the refurbished version. 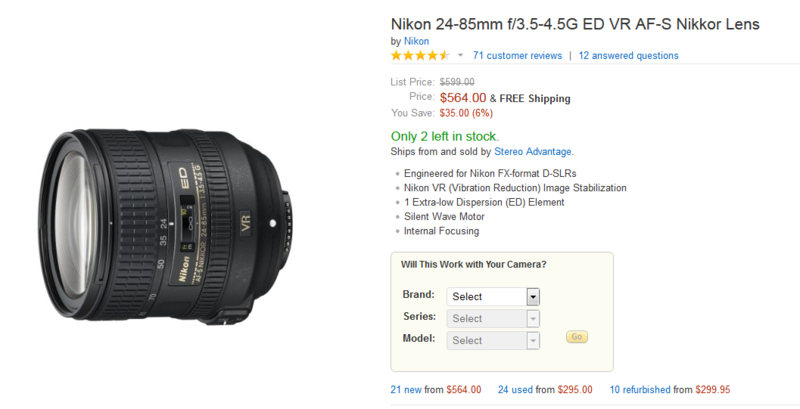 Either way, it is still a great deal on a well reviewed lens. If you happen to miss this great deal from Buydig, I recommend looking at Cameta Camera for other deals. They are currently my favorite source for low priced camera equipment on the web. Buydig has a rockin deal on a Sigma 17-50mm f/2.8 EX lens for Canon digital SLR cameras. Apply coupon code ZOOM150 to take $150 off the price, bring the final cost with shipping down to $418.99. The consensus is that this is a great lens and this price is more than 25% off the price from the next lowest merchant. This lens has a 4 star rating with 235 reviews on Amazon. Some users claim this lens take crisp pictures with a focal length around 50 mm but shots become softer as adjust the shot wider closer to 17mm. A small percentage of users report problems with accurate auto-focusing. You could still use manual focus if that happens to you. I can, however, see how this shortfall would disappoint many customers. While the vast majority of users give the lens a 4 or 5 star rating, many of the lower ratings claim Sigma has quality control issues with this lens that result in an abnormally large number of defective units. Sigma customer support was cited as a problem by a small minority of users. The Sigma 17-50mm f/2.8 EX lens costs less than half as much as the Canon 17-55mm f/2.8EX lens with similar picture quality. The optics are of the highest quality. f/2.8 allows for crisp pictures in relatively low light. 17mm focal length allows for wide angle photos. Sigma is a Japanese manufacture of high quality camera components for Canon, Nikon, Sony, Olympus, Panasonic and Pentax. The company was founded in 1961. They are the largest independent lens manufacturer and remain owned by the founding Yamaki family. When it comes to secondary lens manufacturers, Sigma and Tamron are the two companies that manufacture the widest variety of after market lenses. The Sigma 17-50mm f/2.8 EX lens takes pictures comparable in quality to the Canon 17-55mm f/2.8 EX lens at less than half the cost. Buydig is selling this unit for 25%+ less than the nearest competitor after applying coupon code code ZOOM150. If you are in the market for a lens that can take wide angle shots and perform well in low light, this Sigma is an excellent choice. I haven’t posted a camera deal in roughly a month, which is a damn shame since I LOVE looking for camera deals. I have a good one today for anyone looking to buy an entry level digital SLR without putting much cash on the line. Adorama Camera via Ebay has a Nikon D3200 manufacture refurbished body with an 18-55mm lens for $329.99 shipped. If you purchase this offer, you will earn $6.60 in Ebay bucks to use at a later date. This same kit is almost $400 on Amazon after shipping. The reviews are stellar at over a 4.5 star rating from more than 500 customer reviews. That’s pretty badass in my book. Basically, if you are looking to make a foray into the DSLR realm you probably want to stick with either Nikon or Canon. The glass tends to be more expensive over time than the camera body. You can’t easily use a Nikon lens on a Canon camera or visa versa. Unfortunately, this offer is a time limited Ebay deal of the day. As I am writing this, there is only a little under 17 hours left to take advantage of this offer. I am not saying you should go cry in your beer if you miss this offer though. One of the fun aspects of tracking camera deals and most electronics for that matter is there is usually a better deal right around the bend. That isn’t to say this isn’t a sleek offer though if you are on a budget. If you do partake, one of the first additions you might want to make is to add a telephoto lens. A 70-300mm Nikkor is a good deal in the $150 range. It will allow you to take outdoor pictures at a substantial distance with good quality (always a subjective reference). The f/4-5.6 rating means this lens will be quite abysmal in the dark but that is no biggie if you are using it on clear days. Another great addition to any camera bag is a 50mm lens. 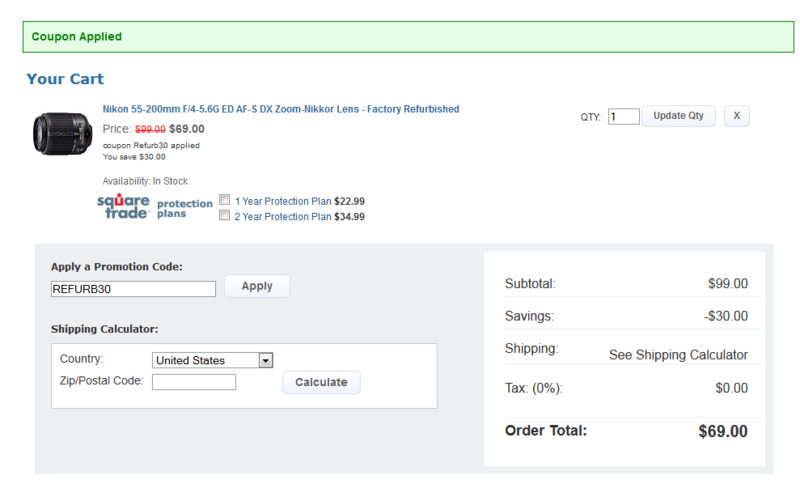 The grey market Nikkor only costs slightly over $100 shipped on Amazon. These lenses are absolutely badass at taking indoor photos even in low light as reflected by the f/1.8 rating. 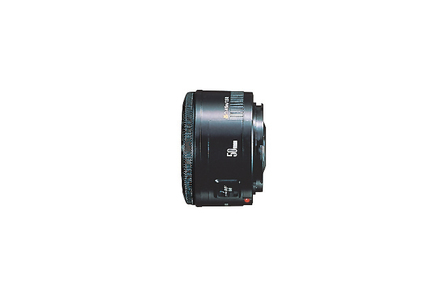 You might be asking yourself at this point, why is the 50mm so cheap? That’s a great question. Research on the Internet claims that this focal length has had the most R&D poured into it over time. That still doesn’t fully explain to me why these lenses are such a good bargain. This is one of those cases where you should probably just go with it though and be happy. One last note – I suspect some of you might either be saying what the hell is grey market or would at least be suspicious of this purchase. This is a common term when it comes to camera equipment, and I think you would be safe. The biggest thing to check for is a difference in the warranty. Grey market items might have a shorter warranty period than items originally intended for the U.S. market. BH Photo has a good write up about the definition of grey market items here.